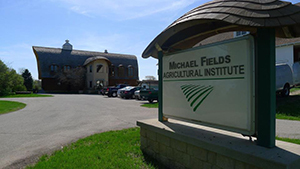 Founded in 1984, the Michael Fields Agricultural Institute (MFAI) is one of the nation’s leading nonprofit advocacy organizations for sustainable agriculture. Teaching children sustainable farming, public programming and lobbying for sustainable agriculture policy at the state and federal level are the daily work of the MFAI. Funded by federal grants and donations, the MFAI also assists retiring farmers in how best to manage their farmland and aids growers in the organic certification process. On the occasion of its 30th anniversary, Executive Director Dave Andrews is impassioned about the mission of the MFAI in East Troy, Wisconsin where a small staff runs large programs as they look toward the future of sustainable agriculture in America. A former farmer, Andrews is well positioned to help traditional growers make the transition to organic, a large part of the MFAI’s work. The MFAI’s 2 acre farm, Stella Gardens, plays host to much of the Institute’s workshops for young and would-be growers. Offering both seasonal internships and outdoor classroom space, Stella Gardens provides a setting for teaching soil management and sustainable growing methods. The food produced at the farm is sold at a farm stand, through local farmers’ markets as well as to wholesalers and schools. Over 370 farmers utilized the workshops and programs last year. MFAI is well-known for its research into sustainable growing practices, such as how to produce organic corn that is as resilient, resistant and hardy as conventional GMO corn species. Now in its 18th year, the corn breeding program has created a diversity of hardy corn varieties for use in sustainable farming. As Andrews points out, organic corn is selling at triple the price of conventional corn. Other current research projects include a long term comparison of biodynamic, organic and conventional growing methods, as well as studies on integrated farming techniques. Policy is another branch of the MFAI’s mission. MFAI policy staff were instrumental in the passage and implementation of the “Farm to School” bill in Wisconsin and work to campaign for sustainable agriculture funding and programing at the state and federal level. They also offer grant writing workshops and policy internships to help educate and build the sustainable grass roots network. USDA organic certification is a large part of the MFAI’s work. “You do have to keep very detailed records and I think that’s what a lot of farmers don’t like to do,” says Andrews. As big brand lobbyists attempt to “water down the requirements” of organic certification, Andrews looks to the biodynamic certification process as a better choice for truly organic growers looking to separate from the widening scope of USDA certification programs. Biodynamics is a triple-bottom-line approach to farming which focuses on biodiversity and closed loop agriculture. “We’re going to continue to do work on the organic side but we’re also going to expand our research into biodynamics,” says Andrews. Having seen both sides of the sustainable coin, Andrews advises new farmers to focus on marketing when seeking to grow profitable organic produce. “Before you plant anything, you need to have it sold. Unless you’ve got a market for it, you shouldn’t be putting it in the ground,” says Andrews. With 30 successful years under their belt, the MFAI moves forward planning marketing programming as well as regional market development for all Wisconsin growers, organic or not.